Love this! 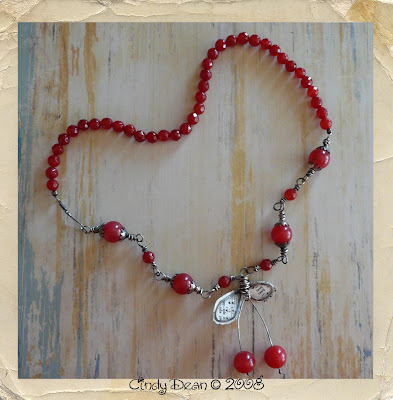 I'm a big fan of cherry items since I love all the 40's and pin-up inspired jewelry and clothes. This is really amazing. Adorable necklace. And I hate wasps. At my house, they and the yellow jackets take up residence behind the shutters on my deck each summer, and I obliterate them with a foamy spray that gives me evil pleasure. Love your recent work, Cindy. And I think the cherry stems are just fine the way they are. I love this necklace and can not wait to see you at the Crafters Market!!! I LOVE IT!!! Can you make me one????? PLEASE!!!!!! Adorable! I was thinking of doing some cherries myself. My sweet mother in law just gave me some choke cherry jam so I must have cherries on the brain. You're doing such nice work Cindy. I'm so glad you could use something from my class!